A simple statement. The new reality. Osama bin Laden is dead. The boogie man is no more. 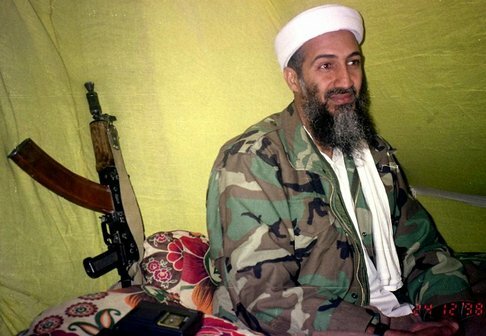 Who was Osama bin Laden and how can I react? Was he a monster as so many believe? There are several sorts of monsters. Some live in the dark. You know the type. They hide in the closet or under your bed – or in the deepest recesses of your mind – until the lights are turned off. Then you must protect yourself by pulling the covers up over your head and lying very, very still. These monsters disappear when you pull the covers away and confront them directly and you find they were nothing more than creations of your own mind. Not all monsters are imaginary, though. They are there, obvious, unavoidable, all too visible. They have names like Aurangzeb, Adolf Hitler, Pol Pot. They do their deeds openly, for all to see, apparently without conscience or caring. These are the ones who run roughshod over the values that we as humans treasure, lacking compassion, seemingly finding pleasure tormenting those with whom they share they earth. On a smaller scale, we call them bullies. They torment those who are weaker than they, unable to defend themseves. Their deeds are malicious, finding joy in the suffering of others. They are murderers of the spirits of others and sometimes murderers of the body, as well. Then there are the monsters who are invisible, living among us, unseen. Child molesters and rapists not yet caught, undiscovered serial murderers, corrupt and dangerous politicians and cops, more that you can add to the list. These monsters, unlike the first type are real and they know who they are. I do not know whether they choose to be monsters or are forced by some inner compulsion to do their evil deeds. There is another type of monster, the kind that has no idea that s/he is a monster at all. The next door neighbour who hates Hindus or Christians or Muslims or Sikhs or Jews is a very naive sort of monster. Perhaps the hatred is directed at black people or brown people or yellow people or pink (white) people. (Those called “red” are really brown.) Maybe the prejudice is aimed at girl children and women, or at men. Then, of course, there are the xenophobes, those who hate foreigners or indeed strangers of any sort. For my readers specifically of Indian background, I would include caste prejudice in this unsavoury list. I suspect that more of us are this sort of monster than would care to admit it. Perhaps, even I sometimes am a naive monster. It is possible for the naive monster to act on her/his prejudices and become a full-blown bigot and a genuine, visible monster. Then there is the monster who so deeply believes in a cause that s/he will do whatever is necessary to realise that cause. No matter if civilians are killed by accidents (collateral damage) or on purpose (terrorism). No matter the damage done because the cause is all. The end justifies the means. Was Osama bin Laden this sort of monster? Or was he the worst sort, the most evil who cynically leads others in a cause – perhaps for power and glory – that he himself had ceased to believe in or had never believed in? I have no way of knowing which of these monsters he was. Or perhaps he wasn’t a monster at all. Perhaps he was a soul who got lost in the swirling changing mass of stuff around us that we call the World or Maya. Whatever he was I am not sorry he is dead. He was a scumbag and I think the world is better off without him. My entire being, however, is repelled at public celebrations of his death. I understand them. I myself felt like celebrating when Indira Gandhi was killed. I did not celebrate, but that might have been simply because circumstances prevented it. I was wrong then, as people celebrating now are wrong now. However evil and vile his deeds, are we just mouthing platitudes when we say all people are children of the same Parent, whatever name you personally use for the Creator? I have lost a brother. A brother who did evil deeds, a brother I am glad to be rid of, a brother I did not love, but a brother nevertheless. It is at times like this that I find it necessary to deeply examine my own beliefs and I find myself not without hypocrisy. I know that Indira Gandhi is my sister, but I am not yet ready to feel it. John Donne’s immortal lines, which I have heard no one quote at this time, come to my mind. I must ask myself how does the death of this man, Osama bin Laden, diminish me. I am not yet able to answer this.